Sometime around 40 my body started to fail me in a number of ways. 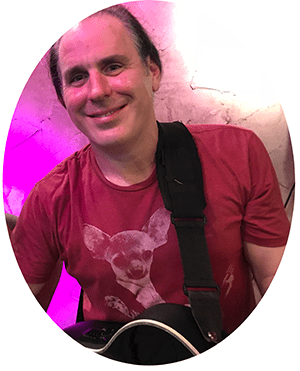 Sure, my knees have been bothering me for years from jumping around on stage playing guitar in Rock bands… but it was my shoulder that was really bothering me. I’ve talked to a number of Guitarist friends who have similar problems. In my business, musicians vary widely in their levels of fitness. In our 40’s a lot of my peers are horribly unfit, have various ailments and still do drugs. On the other side I know some really fit musicians who look half their age. I’d like to think I’m on the good side, maybe 3/4 of the way over to FIT. I’m not perfect, a bit weathered, but I’m in pretty good shape. I definitely feel better than I look, but I’ll take it! The shoulder damage is a direct result of the picking motion of the right arm. It was so bad at one point I couldn’t even rotate it up and around like a normal person. (Think Pete Townsend’s famous windmill motion). It would actually wake me up at night, that’s how bad it hurt. To make matters worse, I had developed tennis elbow in… wait for it… BOTH ARMS. Super fun. It had gotten so painful that I backed out of a friends Wedding who wanted me to play Classical Guitar for the ceremony. This can’t be how it ends can it? I had to do something. I figured I had at least another good 25-30 years of playing left in me. I’m a lifer, not a weekend warrior. I plan to play guitar until I die. I wasn’t ready to succumb to my injuries or worse, let it affect my guitar playing negatively. I quit smoking, got my weight under control and I eat pretty damned healthy nowadays.. but that shoulder was still killing me. I was taking Glucosamine pills and just assumed old age was catching up to my joints. I was probably right, but the supplements didn’t seem to be working for me. Thats how I roll. I was on the self-improvement phase one night. While looking for a new book in iBooks I came across “Stretch: The Unlikely Making of a Yoga Dude” by Neal Pollack. 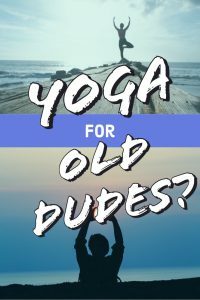 I liked the title and knew next to nothing about Yoga, so I thought I’d give it a shot. It’s not a Yoga book per se, but it did provide a male perspective on Yoga that I could relate to. An older, not in great shape, not young, average dude with anecdotally funny stories throughout. It just clicked with me. In fact, if that book didn’t exist, I’d be using that exact title for this article. I was inspired to at least try Yoga now. This dude was ready. I put the DVD in and gave it an honest try. It was easier than I thought and surprisingly I was able to keep up for the whole 30 minute beginner routine. Flexibility is not one of my strong points, but I could see (and feel) things loosening up even after my first Yoga routine. Sure, I was a little sore the next day. Yoga gets you doing things and using muscles you never even thought of. One of the things I noticed while rolling around on my Yoga mat was the fact that I hadn’t put my body in positions like this since I was a child. Really. I mean seriously, when was the last time you laid on your back and grabbed both feet (while rolling back and forth). For me it was probably age 6. It just feels good though. After a few weeks of messing around with my DVD and some stuff I found on Youtube, I decided it was time to try a real class. 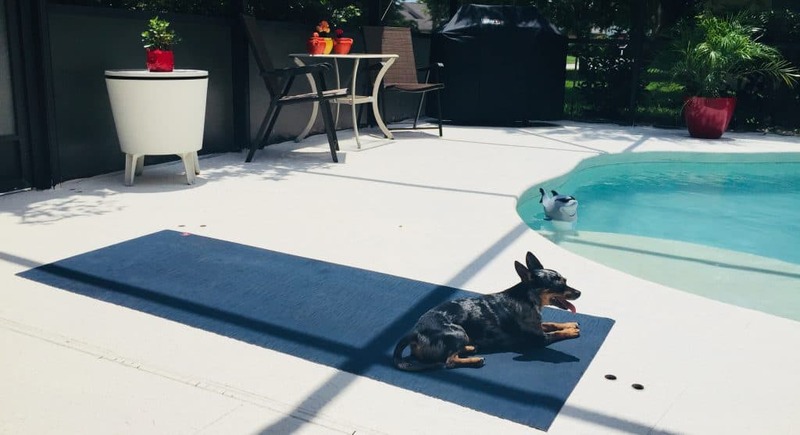 I found a Yoga studio close to my house, Guruv Yoga in Lake Mary. I decided to sign up for a few ala carte classes and see how it goes. I didn’t like it for a few reasons… and probably not the ones you would guess. The music was too loud and in my opinion the wrong kind of music for a Yoga class. It was on the Pop music side and just didn’t jive with my Yoga Dude Vibe. Everybody stinks. I do mean everybody. I don’t mean stinks like the guy in line in front of you at Starbucks with a little B.O… I mean a deep, dark stank that I hadn’t experienced before. Gross. I never went to public gyms or anything before, so maybe you’re ok with this if you have. I was not. It was the smell, the music, very distracting and took away from the overall experience I was hoping for. I thought perhaps it was just that particular class, so I signed up for a few others. They were not much better. I’m not giving up on Yoga classes, but I have been very content doing it at home by myself. (Without the annoying music or stench). This may seem kind of obvious, but it is important and worth discussing. One quick search online for Yoga mats and you’re likely to be overwhelmed with the wide selection of sizes, materials and prices. A bit pricey for a beginner, but if you’ve got the bucks, this is the pro standard mat that will last forever. The first good mat I bought. I still love it and use it for my indoor routines. This is my main mat. At 72″ long this mat is great for anyone over 6’0 tall. Nice and cushy too! For me at 6’1 tall, I found the normal 65”-68” mats too short for me. Once I upgraded to a 72” mat, I felt much more comfortable in my Asanas (poses). There are so many mats available from $10 to $100+. You definitely get what you pay for, but I think a good middle priced point mat is fine to start with. I quickly ditched my cheap Gaiam for a Manduka Eko Lite. The material was much stronger and more attractive. At this point I still wasn’t paying attention to the length, so it was also only 68” long. If you’re under 6’0 tall this mat is a great choice! The biggest upgrade I noticed was that the Manduka Eko Lite didn’t get as slippery once I started sweating. After searching for some longer mats, I found my perfect mat. The Dragonfly Natural Rubber Performance Pro mat. At 72” it was the perfect length and the thick natural rubber feels great under your hands and feet. Nowadays there are so many great Apps and videos available, you can get just as good of a Yoga experience in the comfort of your own home. 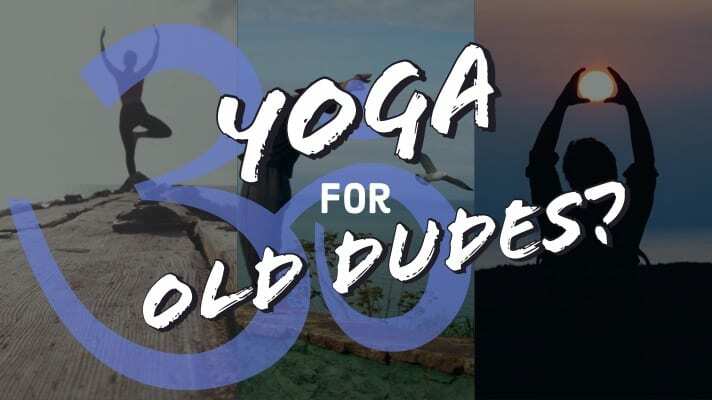 Unless your Yoga teacher is coming over in the middle of class and giving you 1-on-1 advice and adjusting your poses, it’s just no different. Unless you’re paying over $100/hour for private 1-on-1 Yoga classes, it’s no different. In my classes I had no interaction at all with the instructor. Don’t get me wrong, she seemed great but it was no different than watching a video. No different at all. The videos available on the internet and apps are the same as the classes you’re paying to attend. I like them better in some ways because I can control the volume and exact time I start each routine… and no stinky people. (Except maybe me). The best part is, you don’t have to worry about what you look like, and you can hop right into the shower when you’re done. Oh, and the cost of these apps is a fraction of the price of a Yoga class. I really love the Yoga Studio App on my iPad. 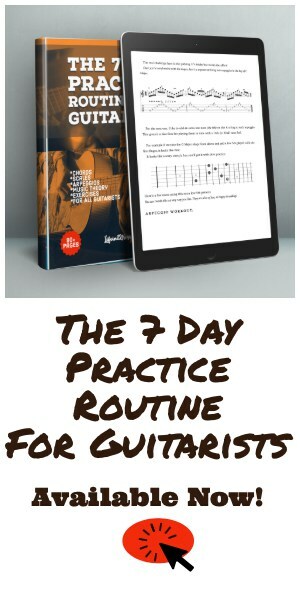 The iPad screen is the perfect size (and volume) for a quiet video practice inside or out. I just set it in front of my mat and go. I started off with all of the beginner classes which are available in 30, 45 and 60 minute variations. It wasn’t long before I was comfortable with the Intermediate routines. I even created some great custom routines in Yoga Studio. You can pick the poses and length for each, and even re-order them however you like. You could also use this feature to re-create a routine you saw in a magazine or website. A good rule to follow in Yoga is: If you don’t like a pose, just don’t do it. Make a copy of the routine giving you trouble, remove that pose (or poses) and save it as a custom routine. You can then save these custom routines for playback whenever you like. Nice feature! Hot Yoga? Well since I live in Florida it’s probably pretty close. My favorite way to do my home Yoga practice is to go out on my back porch and do it outside. My porch area is just private enough so nobody is watching, and I like the extra sweat the summer heat brings on. The hardest thing about this method is keeping my 4 Chihuahuas off of me while I’m doing my routines. After a few months of doing Yoga my Tennis Elbow symptoms had completely disappeared. My shoulder was probably 90% better and I could actually rotate it again. Windmills! My hips, neck and back felt better too. I also have muscles in my back and shoulders I never knew existed. After a few years of regular practice, everything just feels better. Everything! In fact, I feel better than I ever have as an adult and only weigh about 5 lbs. more than I did in High School. What I’ve found is, when I do Yoga I just feel better. Better in my mind and my body. I know that sounds cliche, but it really is true… and lets face it.. I’m about the most unlikely Yoga dude you’ll ever meet. I often tell my wife after a Yoga session, “Remind me when I don’t do Yoga how good it makes me feel when I DO do it”. It’s easy to get sidetracked with your daily grind or even other exercise routines. Yoga isn’t going to burn as many calories as 60 minutes on the treadmill, so you have to find a balance that works for you. I’m always changing up my exercise. Some weeks I’ll do Yoga 5 days in a row, while others I’ll do it every other day alternating with walking or Skateboarding depending on the weather. Regardless, I always throw a few Yoga routines in per week because it just makes me feel better. Eventually I’ll get to that every day Yoga Dude phase. For now I’m just enjoying the journey. Next time I’ll post a few of my custom Yoga Studio routines. Hi Craig, I loved this post. I really like yoga a lot but unfortunately due to my crazy hectic schedule, don’t get to do it much. But when I do, I immediately feel the difference in my body and energy. It’s amazing to see how much yoga has benefited you with your tennis elbow and shoulder! You suggested some great yoga mats which I will look into as well. Thank you Amira! Yoga has helped me so much. I love it! PS- Your website is awesome! I’m definitely going to send you some legal referrals. Thanks Steve! I probably understated how much Yoga has helped me. Stick with it buddy. Hey you’re not by any chance from Canton , Oh are you? I had a friend named Steve Vandevere years ago. Oh! That sounds interesting. Yeah my knees are kind of a mess. Skateboarding (in my 40’s) has only exacerbated that fact. I will definitely look into that. Feel free to drop a link if it’s something you do or have written about. LOL! Thank you Beth… it’s true! Glad you liked it. This has inspired me to bust out the old yoga mat again! Ha! Yo go Deanna! I’m so glad. I finished all the lessons in a beginner’s video doing the macho versions of its poses (because, hey, I’m a guy, right?) and was repeating the whole course all over again but this time after the lesson for Core …wow…I was shaking. Anyway, it exacerbated a tiny weak area into surgery level. Now, though, I’m ready to go again, but will start with the wimpy versions of the poses this time. Haha. Yeah I hear ya. It took me a while to not be horribly sore. I try to get in 3-4 good routines per week and that keeps me feelin pretty good. Eventually I do want to do it every day.